Battery life (hours) : voice - 7 hours max. Battery life (hours) : signal - 2 hours max. 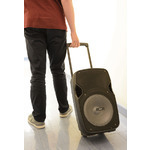 A compact, trolley-style wheeled portable PA unit with a top-mounted retractable pull handle. Versatile input options include a VHF wireless neckband microphone (included), 2 further mic inputs (one can also be used for guitar), mini jack (for phones, tablets, laptops and mp3 players), and RCA in/out (ideal for DJs). An internal media player works directly from SD card or USB memory stick, and a switchable VCV �voiceover feature automatically lowers the volume of background music when the mic/s are used. A 35mm pole mount enables the unit to be used on a stand. Mains or internal battery power (up to 8 hours). A compact, trolley-style wheeled portable PA unit with a top-mounted retractable pull handle and side-mounted carry handle. 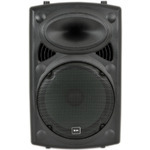 Versatile input options include 2 VHF wireless microphones (included), 2 further mic inputs (one can also be used for guitar), mini jack (for phones, tablets, laptops and mp3 players), and RCA in/out (ideal for DJs). An internal media player works directly from SD card or USB memory stick, and a switchable VCV �voiceover feature automatically lowers the volume of background music when the mics are used. A 35mm pole mount enables the unit to be used on a stand. Mains or internal battery power (up to 8 hours). 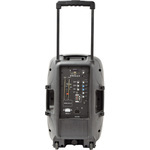 Portable PA unit with built in multicolour LED light show behind the front grille. 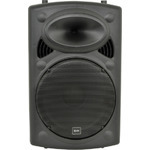 Built into a sturdy moulded cabinet and trolley assembly. 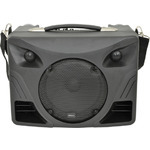 Powered from 230V mains or the internal rechargeable battery for true portability. 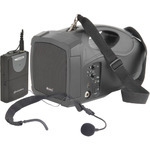 2 x VHF wireless handheld microphones and USB/SD media player with FM tuner and Bluetooth receiver. 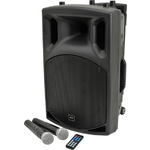 Complete entertainment system for parties, singers and performers. 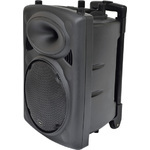 A self-contained PA system with pull and carry handles for easy portability, and a host of connectivity options including Bluetooth. The unit is supplied with 2 VHF wireless microphones, and features 2 further mic inputs, one of which doubles as a guitar input. The aux input is ideal for phones, tablets, laptops and mp3 players; and the RCA in/out adds DJ connectivity and expansion/recording possibilities. SD and USB media, an integrated FM radio tuner, and paired Bluetooth devices can be controlled via the internal media player with IR remote control. 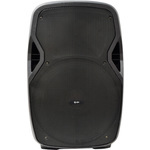 A switchable VCV �voiceover function automatically lowers the volume of background music when a mic signal is received. 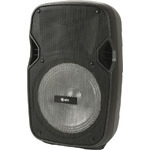 Powered by mains or internal rechargeable battery (up to 8 hours), and pole/stand mountable.